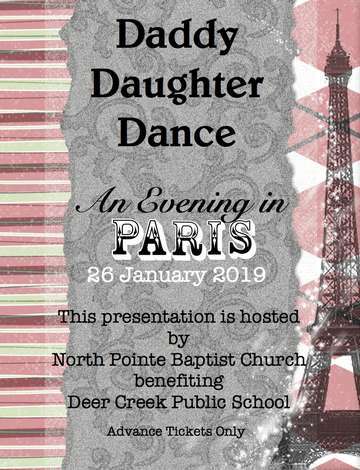 North Pointe Baptist Church invites you and your lovely daughter to spend an Evening in Paris. The event benefits Deer Creek Public Schools but is open to everyone. This year we will host two sessions. There's no age limit on any of our dance sessions. We invite Dads, Grand Dads, Step Dads and Father figures to bring your mademoiselles for a special dance to celebrate this wonderful new year with Joie de vivre! Our event will offer a wide variety of music by a professional DJ, a professional photographer, themed decorations, snacks and drinks. Our theme is "Evening in Paris". Take an evening stroll through the beautiful gardens of Paris and trip the light fantastique under the vast electric stars in the City of Lights. Don't forget your beret! We look forward to seeing and serving your family. Thank you for supporting Deer Creek Public Schools.